Many people don’t realise they drink more alcohol than the recommended government guidelines. Drinkaware’s mission is to make them recognise this and change their behaviour. With that in mind, Drinkaware commissioned me to write and manage the design of a ‘Drinks diary’, where people can note down how much they drink over a month to see if they need to cut back. To produce a compact diary 18-30 year olds of both sexes can carry around with them for a month and use to note down how much they drink. The diary had to be packed with clear, friendly, non judgemental messages about the risks of drinking and cutting back. It also had to be attractive so people would pick it up everywhere from doctors’ surgeries to pubs. I wrote the copy for the diary, and worked with a designer to come up with clever design concepts. 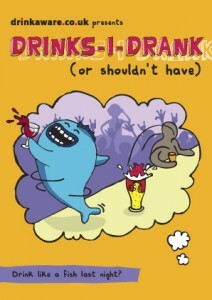 A bright A6 publication that’s impossible to ignore, packed with funny cartoon illustrations and Drinkaware’s key messages.